What we&apos;re learning at the Television Critics Association summer session: People are really polarized about AMC&apos;s "Rubicon" - you either like/hate it; "The Big Bang Theory" cast is pretty upbeat about their move to the Thursday at 8pm slot (see video with Simon Helberg below) despite not being consulted about the move according to show producer Chuck Lorre; CBS is banking a lot on the success of "Hawaii 5-O" and after viewing the pilot, we think it will be successful as it&apos;s pretty good action/humor to turn your brain off to. 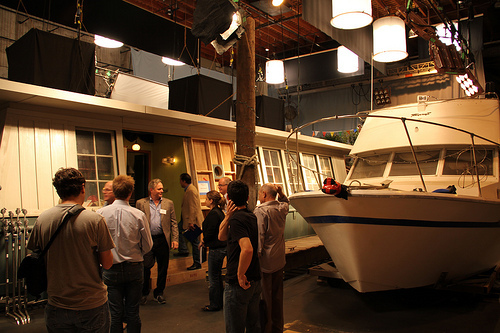 We experienced the most incredible moments of surrealism at yesterday&apos;s "Parenthood" set visit at Universal. First off, the sets are pretty amazing and really do a more than adequate representation of Marin County architecture and setting; they&apos;re filled with plenty of real world items from the Pottery Barn, Williams-Sonoma, and Restoration Hardware catalogs that we throw away every week, and by "filled", we mean that all the drawers and cabinets are really filled with utensils, clothing, tools, toys, etc. so the realism is more than palpable. It was weird enough to walk into the world we&apos;ve seen on TV and even weirder to have been greeted by Peter Krause and Monica Potter upon walking into it. They joked that they felt like they should have had some Halloween candy to hand out to the journalists as they walked through the set and introduced their favorite rooms or set pieces. They were upstaged on the 2nd set we visited as Craig T. Nelson and Bonnie Bedelia _did_ have fresh-baked cookies and lemonade in their impressive arrts & crafts remake. In the panel discussion that the cast and producers had after the set tour, what became most apparent about "Parenthood" is that NBC is behind the show. The producers and several of the actors stated that they really didn&apos;t hit their stride until the 6th episode, and this was after a pilot that they thought was a little wobbly. Compare that to CBS and their treatment of "The Bridge" (and probably "Flashpoint") in that they had no problem killing the series after 3 episodes, giving the show virtually no time to find its legs, because "it wasn&apos;t giving us the numbers", not that NBC hasn&apos;t been guilty of similar behavior. Why was "Parenthood" spared? The Ron Howard connection? Whatever the mystery it&apos;s nice to see what could be a superb show catching a break and being given time to find itself. 8:00pm Big Brother CBS - The veto competition takes place. 8:00pm So You Think You Can Dance Fox - The top six contestants perform three routines each. 9:00pm America's Got Talent NBC - Four more acts make it into the top 24; Mike Posner performs; JabbaWockeeZ perform. 9:00pm Top Chef Bravo - Chefs must prepare a power lunch at Palm restaurant. 9:00pm The Fabulous Beekman Boys Planet Green - John leaves Brent and Josh in charge of the herd of pregnant goats. 9:00pm Network TCM - (1976) A TV executive (Faye Dunaway) boosts her ratings with a mad anchorman (Peter Finch) who thinks he speaks for God. 10:00pm Man Shops Globe Sundance - Keith hunts for modern ceramics in Sweden. 11:00pm Chelsea Lately E! - Chicken Charlie from the Orange County Fair. 11:35pm The Tonight Show With Jay Leno NBC - Actress Eva Mendes; actor Isaiah Mustafa; Robert Cray performs. 12:05am Jimmy Kimmel Live ABC - Actor Zac Efron; author Lisa Ling; Rhymefest performs. 12:35am The Late Late Show With Craig Ferguson CBS - Actress Carrie Fisher; actor Ron Livingston. 12:35am Late Night With Jimmy Fallon NBC - Actor Luke Wilson; comic Tommy Davidson; Dierks Bentley performs.